VANCOUVER, British Columbia, Sept. 11, 2018 (GLOBE NEWSWIRE) -- Chakana Copper Corp. (TSX-V: PERU; OTC: CHKKF; FWB: 1ZX) (the “Company” or “Chakana”), is pleased to announce assays from four additional core holes into Breccia Pipe 1 (Bx 1) at its Soledad copper-gold-silver project in central Peru. A portion of the Soledad Project is subject to an option agreement with Condor Resources Inc. where all drilling to date has occurred. These results follow from a Phase 1 program that began August 16, 2017. Results of the previous fifty-four drill holes have been released and are also available at www.chakanacopper.com. The four holes reported here were designed to explore the limits of Bx 1, including the main breccia pipe (Main Zone) to the northwest and northeast with one hole also orientated to test the deep extension of the blind North Zone breccia pipe, all from a central platform (Fig. 1). Section looking west showing the Main and North breccia bodies at Bx 1 highlighting holes in this release. Light red 3D shapes based on Leapfrog model of breccia from all holes drilled by Chakana. Drill holes show tourmaline breccia (red), andesitic wall rock (green), and other host rocks (other colors). Section includes data from 50m in front of and behind section. 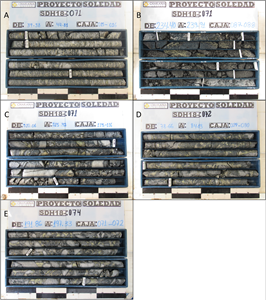 Mineralized intercepts from four holes discussed in this release showing different styles of mineralization in Bx 1: A) SDH17-071 – classic high-grade shingle breccia from the Main Zone; the interval 39-45m assays 16.77 g/t Au, 3.20% Cu, and 49.0 g/t Ag; B) pre-mineral feldspar monzodiorite porphyry with sulfide replacement textures; the interval 234.5-45239.45m assays 2.70 g/t Au, 2.26% Cu, and 1,145.7 g/t Ag; C) SDH18-071 – mosaic breccia from the North Zone; the interval 310-315m assays 0.37 g/t Au, 1.18% Cu, and 93.6 g/t Ag; D) SDH18-072 – mosaic breccia from the Main Zone; the interval 78-84m assays 3.15 g/t Au, 3.22% Cu, and 69.9 g/t Ag; E) SDH18-074 – high-grade margin zone mineralization from the Main Zone; the interval 192-197m assays 2.09 g/t Au, 3.38% Cu, and 317.4 g/t Ag. 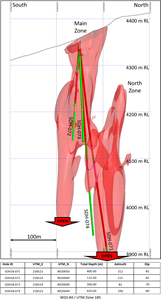 Drilling demonstrates that Bx 1 extends from surface to 439m depth and is open at depth, highlighting the vertical extent these tourmaline breccia pipe targets potentially offer. Drill hole SDH18-071 cuts this vertical extent, returning 0.69% Cu, 1.45 g/t Au and 50.5 g/t Ag (2.07% Cu_EQ; 3.16 g/t Au_EQ). It is notable that this hole first cuts a thick interval of the Main Zone breccia with 207.45m at 0.88% Cu, 2.58 g/t Au, and 53.0 g/t Ag (3.02 Cu_EQ; 4.62 g/t Au_EQ) from surface, cuts pre-mineral intrusive host rock with 32.95m at 1.37% Cu, 1.03 g/t Au, and 211.1 g/t Ag (3.85% Cu_EQ; 5.89 g/t Au_EQ), then enters the blind North Zone breccia returning 139.05m with 0.54% Cu, 0.47 g/t Au, and 29.3 g/t Ag (1.10% Cu_EQ; 1.68 g/t Au_EQ) beginning at 300.75m. This hole deviated out of the pipe at 439m, leaving mineralization open to further extension. “Hole SDH18-071 is the best hole ever drilled on the property to date in terms of grade-thickness. The vertical extent confirmed in this hole, combined with the discovery of the blind North Zone (see news release dated June 26, 2018 at www.sedar.com), highlights the exploration potential of the Soledad project. It is also noteworthy to see mineralization in the pre-mineral host rock to the tourmaline breccia” states David Kelley, President and CEO. Examples of mineralized intervals from holes in this release are shown in Figure 2. The Phase 1 drilling program was increased to 18,863m in 70 holes over and above an original planned program of 16,660m. The original Phase 1 drill program was expanded due to the discovery of a blind breccia body immediately north of the exposed main breccia pipe (North Zone). A Phase 2 drill program began at Soledad, as announced August 15, 2018, utilizing a second core rig where drilling is currently in progress at Bx 3E and Bx 6 (see news release dated August 15, 2018 at www.sedar.com). A total of 14 mineralized breccia pipes have been identified in two clusters within an area of 3,085 hectares where Chakana has or can earn a 100% interest (see news release dated July 16, 2018 at www.sedar.com). Chakana follows rigorous sampling and analytical protocols that meet or exceed industry standards. Core samples are stored in a secured area until transport in batches to the ALS facility in Callao, Lima, Peru. Samples batches include certified reference materials, blank and duplicate samples that are then processed under the control of ALS. All samples are analyzed using the ME-MS41 (ICP technique that provides a comprehensive multi-element overview of the rock geochemistry), while gold is analyzed by AA24 and GRA22 when values exceed 10 g/t. Over limit silver, copper, lead and zinc is analyzed using the OG-46 procedure. Figure 1 – Section looking west showing the Main and North breccia bodies at Bx 1 highlighting holes in this release. Light red 3D shapes based on Leapfrog model of breccia from all holes drilled by Chakana. Drill holes show tourmaline breccia (red), andesitic wall rock (green), and other host rocks (other colors). Section includes data from 50m in front of and behind section. Figure 2 – Mineralized intercepts from four holes discussed in this release showing different styles of mineralization in Bx 1: A) SDH17-071 – classic high-grade shingle breccia from the Main Zone; the interval 39-45m assays 16.77 g/t Au, 3.20% Cu, and 49.0 g/t Ag; B) pre-mineral feldspar monzodiorite porphyry with sulfide replacement textures; the interval 234.5-45239.45m assays 2.70 g/t Au, 2.26% Cu, and 1,145.7 g/t Ag; C) SDH18-071 – mosaic breccia from the North Zone; the interval 310-315m assays 0.37 g/t Au, 1.18% Cu, and 93.6 g/t Ag; D) SDH18-072 – mosaic breccia from the Main Zone; the interval 78-84m assays 3.15 g/t Au, 3.22% Cu, and 69.9 g/t Ag; E) SDH18-074 – high-grade margin zone mineralization from the Main Zone; the interval 192-197m assays 2.09 g/t Au, 3.38% Cu, and 317.4 g/t Ag.